Sort of a Prostest Blog – Solving world issues and the personal things. I bought a ThinkPad less than 2 years ago because of it’s long standing in making awesome laptops. Unfortunately for me, the Lenovo ThinkPad SL500, despite it being more expensive and having a more recognized name in the mobile computing industry does not live up to its ThinkPad name. I saved up quite a while for this laptop and brown bagged a lot of lunches to buy this and I even had to wait an extra week from the “expected arrival date” after I bought it. Imagine my dismay when I attempted to open my laptop, like I’ve done before on many occasions, only to hear it crack and snap. These ThinkPads had been advertised as being “tough” and “robust” but the left hinge of my laptop, which has never left the confines of my desk since I bought it, has simply broken off from its apparently flimsy connection to the LCD and keyboard. I googled around and found that I was not the only one to experience the left hinge breaking. It looks like it has been happening quite consistently among other Lenovo ThinkPad users. 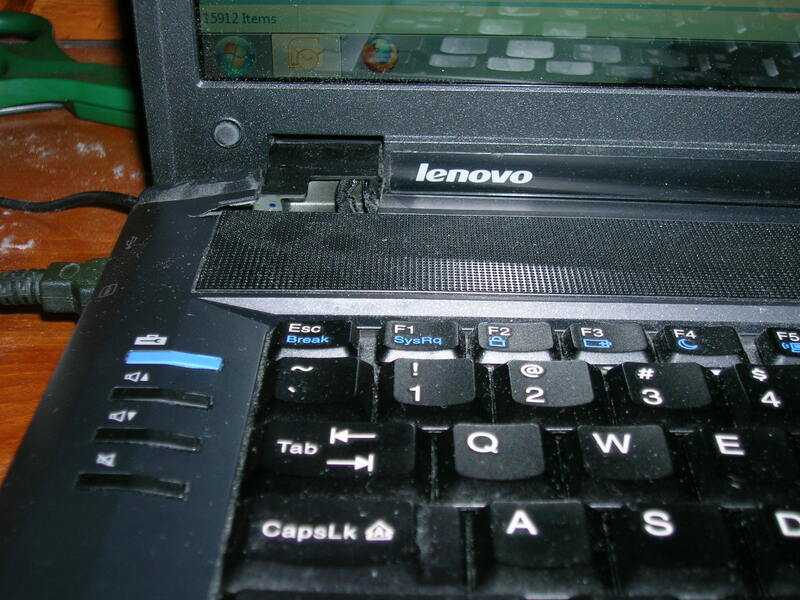 On the Lenovo forum, I saw that at least two SL400’s have had their hinges break in the last few months. Two more SL500’s have also been reported to have had the same issue as well. There were at least 8 people who bothered to report the issues on the website and three of them as well as myself have had their hinges break in the last two months. I sincerely hope that Lenovo will do whats right and provide proper compensation or replace these broken laptops. I have the same issue, in less than six months after I bought my Thinkpad SL5000, the left hinge broke. Its crazy. If it’s only been 6 months then they probably won’t give you any trouble if you ask them to repair it without paying a penny. Give it a shot! Same problem for me, left hinge broke. warranty does not apply as it’s a broken/worn problem. Anyway, spare part is quite cheap. My SL500 hinge has broken just like yours, after 18 months and no abuse. I am going to try to contact Lenovo on this but doubt they will help me out. I also faced same problem after 1 year. Absolutely, left hinge of this models have a design problem. Lenovo wanted $400 for that “cheap” repair. I insisted it was a factory defect and they eventually agreed. Maybe you guys should contact each other and ask Lenovo to repair your laptops as a group? Try calling them first and if that doesn’t go anywhere, e-mail the people at the top of the company and politely ask them to fix this potentially hazardous problem. Spare part only cost me 19.5€ HT shipped by Lenovo (set of two hinges). Took me about an hour to change it, not very simple. 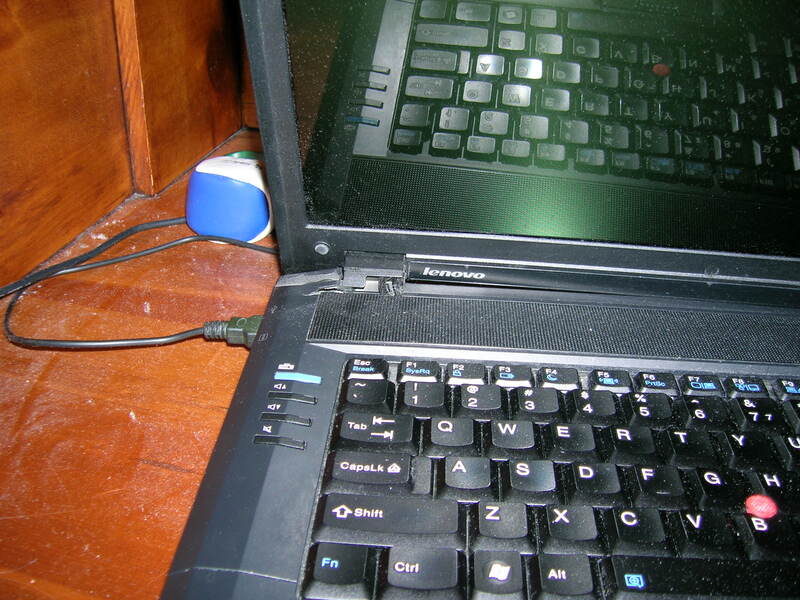 This same problem happened to my Lenovo SL500 after about 18 mos. I couldn’t figure out how it had happened, but it appear that it is actually a flaw in design. My left hinge is completely broken, and now the grate over the speaker has been affected. Routinely my screen topples over backwards because of the hinge problem. My warantee was up in December, but I didn’t even to think to contact them about this because I assumed it wasn’t something they would fix. Any ideas?? The same exact thing happened to mine, just out of its warranty. So frustrating. I suggest you guys e-mail Lenovo and complain. If you do it as a group it might help. Maybe try contacting their Facebook guy or the CEO of Lenovo? Focus on the obvious design flaw and how it is potentially hazardous. Take photos too. I wanted to ask you (or any others who have gone into repairing this problem on their own), if you could post a summary of the instructions here, or some link to instructions on how to do it on my own. By the way in my case it was the left hinge again that broke after about 1.5 years of purchase. i agree with andy, instructions from someone who has already changed the hinges would be great! Same problem only hanging by wire this laptop is a pos. Just an update, after having my hinge fixed at the start of this year, I’m having a hard time closing the lid AGAIN! It started making the cracking sounds so I’m just leaving the lid open before it gets any worse. I have a feeling it has to do with where they put the fan on the laptop. I am having the same problem, left hinge broke. I’ve tried looking all over for an email or phone number to call. I emailed sales, they referred me to service. I called service, they wouldn’t talk to me because it was out of warranty. Actually hung up on me. Does anyone have a phone number that would work to get me to a person? it is unclear why, but ever since lenovo bought the thinkpad brand they decided to make the thinkpads it as weak as possible, thus, they redesigned the fan and left hinge part so as to break off easily in order for u to buy a rollcage every month or so. to add insult to the injury, the thinkpads after t60 have less and less magnesium in them while making the fan area even more fragile so the left hinge will break every day. Having repaired 4 of these already from a batch or 15, I’d say it’s a unfortunate design defect. The break occurs in the same place on the bracket every time. The metal in the left hinge is about 2mm narrower than the right hinge, and there is a 2mm hole for overlay on a support peg from the bottom frame. This peg usually breaks off when the hinge cracks… or maybe before. There is a lot of friction torque on these hinges. 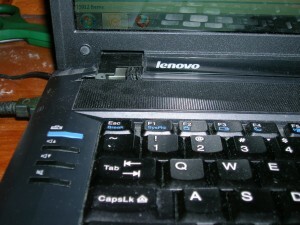 Opening the laptop from the edge or corner instead of the tested center probably exacerbates the defect until failure. So I just inherited a SL500 with…yup, a broken left hinge! I think that contacting the better business Bureau about this poorly designed POS is the direction I am heading. I am in the process of searching out some step-by-step instructions on replacing the hinge. Shame on you IBM for not standing behind YOUR clear design flaw! My wife’s SL500 is starting to show signs of the left hinge failing as well. I also noticed a crack on the left side of the screen bezel near the hinge also. I’m going to attempt to DIY the repair. What tools do I need, Kazys? Definite design flaw. I went with Lenovo over Dell and others b/c it is supposed to be more durable. The LCD is sturdy, but the hinges clearly cannot support the weight. I have the same problem with my Lenovo SL500. The silly thing is that I know someone with a much older model and funny enough the left hinge is broken on that laptop. It is absolutely ridiculous that this issue with the hinges has been happening for so long and yet they keep using the same design over and over again. Not happy at all. I am going to see if I can fix it myself but seriously, Lenovo no longer has a good reputation in my eyes. i’m glad to know that i am not the only one experiencing this problem..my wife bought my lenovo S500 as a christmas gift and to my horror the left screws to the hinges simply started to fall out and before i knew it the entire left top corner began cracking open. its a great computer but i cant trust the reputation any more.